Columbus, OH – For its final outing ahead of the 2018 Ohio Valley Conference Indoor Track and Field Championships, Austin Peay State University track and field put on quite a display at the Buckeye Tune-Up, hosted by Ohio State, displaying some of its best performances to date. Crucially, sophomore Tymeitha Tolbert picked a perfect time to post Austin Peay’s season-best in the 60m dash. The Nashville native, who qualified sixth for the finals (7.78) along with sophomore Diamond Battle (7.88, eighth), pushed up her pace in the finals with a career-best 7.71 mark, placing fourth and moving up to sixth in the OVC. She backed that up with a 26.45 200m mark, placing fourth. In the hurdles, a pair of freshmen boosted their stock heading into next week’s championships. 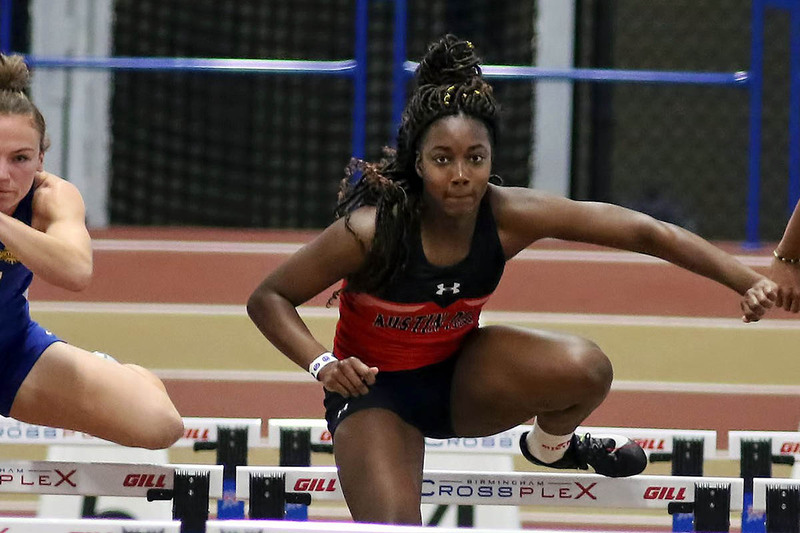 Lennex Walker‘s personal-best 8.63 in the finals was Austin Peay’s best showing of the season in the 60m hurdles, while freshman Denia Hill-Tate‘s 9.06 mark in the finals, which earned her a fifth-place finish, was a career-best. Walker sits in third on the OVC 60m hurdle best lists heading into next week. Expanding the distance, freshman Sabrina Richman enjoyed a 58.20 mark in the 400m dash, placing fifth. She was joined by freshman Allana Johnson, sophomore Amelia Thiesing and senior Allysha Scott to gain runner-up in the 4x400m relay with a 3:57.14 mark. In the field events, Austin Peay got its usual exemplary showings in the pole vault; junior Savannah Amato was third with a 3.91m mark—her third consecutive week at 3.90m or higher—while junior Dascha Hix was just outside the top-five at seventh (3.76m). Battle—who also finished seventh in the aforementioned 60m dash finals—was sixth in the long jump at 5.10m. The Govs reach the pinnacle of the indoor season next week, traveling to Charleston, Illinois for the 2018 OVC Indoor Championships.